A young couple of newlyweds moved to Auburn from Reno on New Year’s Day hoping to start their new life together in a new city, full of hope and new opportunities. They moved into an unfurnished rental duplex and on January 20 the unexpected occurred – the clothes dryer caught on fire resulting in major damage to their new home. The call came in at 4:00 pm. DAT volunteers Heath Wakelee, Chuck Snodgrass and Beryl Mayne agreed to respond to the duplex on Oak Street in Auburn. The volunteers were able to talk to the young couple to get their information and provide the immediate assistance they needed – food, clothing and shelter. A new version of the American Red Cross Monster Guard: Prepare for Emergencies App is now available to help save lives through gaming. Children between the ages of 7 and 11 learn ways to prepare and stay safe in home fires, hurricanes, tornadoes, floods and other disasters by role-playing as different monster characters. Monster Guard is a complement to The Pillowcase Project, a free Red Cross youth preparedness program designed to increase children’s awareness and understanding of natural hazards and reduce their fears. Participants learn safety and emotional coping skills, along with personal emergency preparedness skills. Information on The Pillowcase Project is available at redcross.org/prepare. The Monster Guard App and The Pillowcase Project are both sponsored by Disney. The app and The Pillowcase Project are also key components of the Red Cross Home Fire Campaign to reduce deaths and injuries from home fires by as much as 25 percent over the next five years. The campaign focuses on increasing the use of smoke alarms in neighborhoods with high numbers of home fires and encouraging everyone to practice their fire escape plans. A family of three were sound asleep when a 40-foot tree fell down on their mobile home in Rocklin, CA, demolishing it completely. Fortunately, they were uninjured and able to escape into the darkness of night. I was the Disaster Action Team lead and Arry Murphy was my volunteer teammate. We found the family frantic, as anyone would be. The 19 year-old daughter ran to us as soon as we parked the Red Cross response vehicle. We learned that neither of her parents speak English, so she acted as translator enabling us to complete our initial case work. The family does not have home insurance, nearby relatives, nor savings. Sadly, this is a frequent finding when the Red Cross is called out to help. We provided the family with immediate assistance and they were very grateful. I am blessed to be the face of the Red Cross in my community, but I’m not alone. There are thousands of volunteers all over the country who, without their selfless dedication, the Red Cross could not reach as many people in need. Posted on January 22, 2016 February 26, 2016 Author Gold Country CrosswordsCategories News, Uncategorized, Volunteer PostsLeave a comment on Think The Red Cross Only Responds To Natural Disasters? Think Again! The American Red Cross Gold Country Region volunteers, partners and ‘small’ staff are getting really good at this: the Home Fire Campaign. 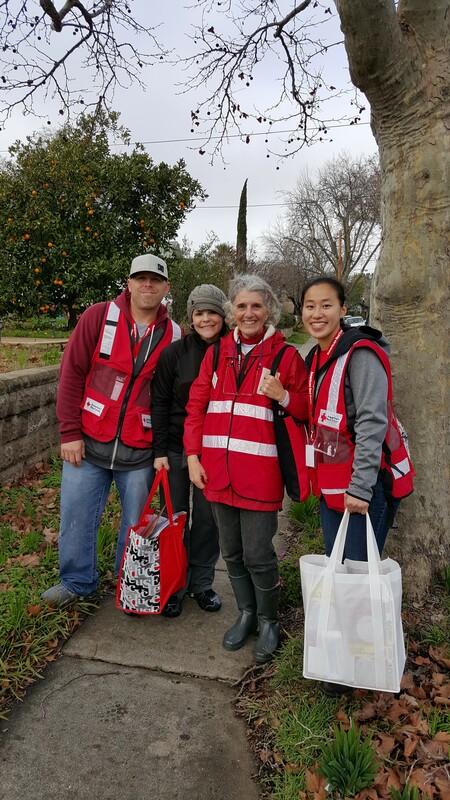 This past Saturday, January 16, teams of volunteers went out to canvass neighborhoods in Woodland and Roseville to install smoke alarms and educate residents on their fire escape plan. In Sacramento, our volunteers went out to homes that had made prior appointments for these installations. 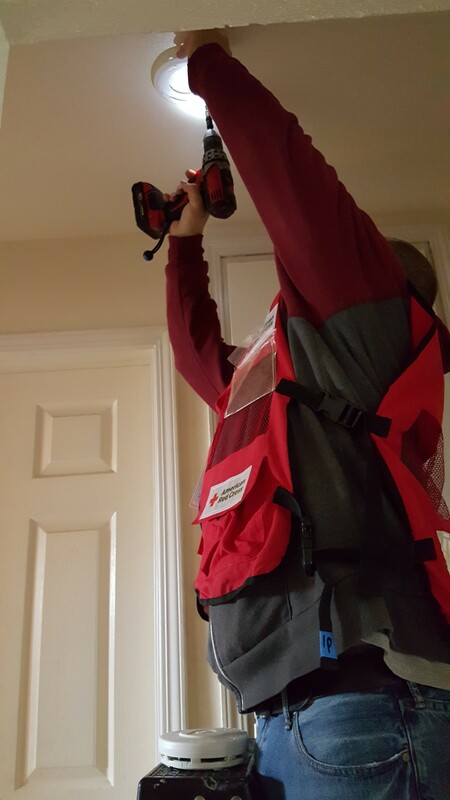 We had so much success during the event in December that people called our offices non-stop requesting smoke alarms!! Which is awesome by the way. A good day all the way around! Check out all the pictures from this weekend’s effort, visit our Flickr Album: http://rdcrss.org/1J1CgFw . Bryan Arellanos is a soft-spoken 16-year-old who attends Tokay High School in Lodi, CA. He loves race cars, video games, and above all else, Bryan Arellanos, loves his family. He bravely demonstrated his love on December 31, 2015. On that day, Bryan suffered second degree burns over much of his body while getting his brother and sister to safety as their home went up in flames. Baryan and his brother Christopher, 14, who Bryan describes as a “special ed child” were up early. They were playing video games in the living room of their home while Bryan’s sister, nine-year-old Betsey, was fast asleep in her bedroom. Their mother was at work. This was a normal day for the family, until the thing that we never expect, happened: a home fire. Around 7:30 AM, Bryan took a break from the video games and left the living room for a few minutes, leaving his brother on his own. When Bryan returned, the family Christmas tree was engulfed in flames. Bryan ran to get a bucket of water in an attempt to douse out the fire, but it was too late. By the time he returned with the water, Bryan says, “fire was everywhere.” Christopher had run to find safety in their mother’s bedroom. Bryan knew he had to get his brother and sister out immediately. The flames were traveling fast. And Betsey was still sound asleep in her room, unaware of what was happening. Bryan ran to her room , woke her up, and pushed her out the bedroom window. She was scared and confused and started to cry. Bryan told her not to cry. It would be okay. Then he went to find Christopher. By now, Bryan’s arms were burning. Bryan said, “The fire was everywhere, on the couch, the ceiling, the floor, and a lot of smoke. I couldn’t see. My eyes were burning. I was coughing so bad…” But, Bryan pressed on. He found Christopher still in their mother’s room. He was safe. Bryan had to get him out. They couldn’t make it through the fire in the living room. So Bryan knocked out the bedroom window screen and pushed his brother through. At this point, there was nothing more Bryan could do. Betsey and Christopher were safe and unharmed. But, Bryan was not so lucky. Bryan misses Betsey and Christopher. And they miss him. So recently, it was a very special day when they visited him in the hospital. They talked and teased and hugged and kissed. Bryan ’s parents visit him often. He asked his mom to bring him a Bible which he reads from everyday. Bryan says he prays to get better and every day he is a little better. And he says his mom kisses him on the head every night because that always helps him feel better. Bryan ’s family is grateful that he was able to save Betsey and Christopher. And, Bryan is happy that his brother and sister are safe because as he says, “they still have a long life to live.” Bryan isn’t sure when he will leave the hospital, but he looks forward to going back to school, seeing his friends, and most of all, being with his family. Baryan’s family’s home, and almost everything in it, was totally destroyed by the fire. The American Red Cross is providing the family’s immediate emergency needs, such as lodging, food, and clothing to help them through this very difficult time. Friday January, 22, 2016 – 11:30 a.m. – 1:00 p.m. The Annual Red Cross Hero Recognition events are always a great way to kick off a brand new year. Recognizing the goodness of people in our community motivates us and we want to continue to inspire our communities. Join us this coming Friday, January 22 as we will gather to honor community members from El Dorado, Placer, Sacramento and Yolo Counties who have performed extraordinary acts of courage. As you might remember, this annual event pays special tribute to local everyday heroes who have gone above and beyond, performing heroic acts and rising to the occasion to help those in need. This year’s honorees were nominated by members of the community for such selfless deeds as saving lives, performing First Aid/CPR, providing support to military veterans, and much more. Here are the names of the people we will be recognizing this year and what they did to deserve such praise. Dennis Dwyre, Eric Paulson (Davis) – Dennis and Eric prevented a tragedy during a basketball game they were getting ready to play. They performed CPR to save the life of a fellow teammate. Ivan Romero, Jr (Roseville) – Mr. Romero witnessed an accident which caused a vehicle to explode into flames, but Mr. Romero’s quick actions helped save the life of a woman from the burning vehicle. Hector Alvarez (Folsom) – Reserve Police Officer pulled a driver from an engulfed vehicle when on-duty. Paul Grenier, Kevin Shepherd, Tom Borghese (Rocklin Police Dept)- Chelsea Johnson, Natalie Donaldson (AMR) – Steven Reynolds (Neighbor) (Rocklin) – Working as a team they helped a Rocklin citizen return to life after he had suffered cardiac arrest. Scott Gallegos (Elk Grove) – Scott put his own life on the line during a gun fight, rescuing a woman from flying bullets and taking care of her immediate needs. Amy Parkko (Garden Valley) – Rescued a missing dog, helped him receive medical treatment after a traffic injury and helped reunite the miniature Australian Shepard with his family in Oregon. Jeff Wolford and Stanislaus Wiecek (Yolo) – Rescued four horses and two burros from the flames of the Valley wildfire. UC Davis Firefighters Burn Institute (Sacramento) – The entire team is recognized for their care and treatment of the brave men and women who fought the Butte and Valley fires. Theresa Ramos (Sacramento) – After being held hostage at gun-point, Theresa and two of her friends escaped by using a Taser gun on their captor. Jeremiah Norrell (Placerville) –Jeremiah became a volunteer in late 2014. Since then, he has completed over 50 online and classroom training courses which have equipped him to serve the Disaster Action Team. With the new knowledge he served as Shelter Manager during the Butte Fire in September. Every day, he looks forward to growing even more in his service to others. Nugget Markets – Whenever our Region is struck by a large disaster, Nugget Market is among the first to step forward and help by donating cash, food for shelters or supplies. Nugget has also donated pallets of water, gift baskets for events and food for military send-off events. DH Construction – a longtime supporter of the Red Cross in our Region, DH Construction makes donations on behalf of their employees, provide comfort kits to families who lose their homes in a fire, and support our special events. Event Master of Ceremonies is CBS13 Anchor Sam Shane. Proceeds from the luncheon will support the critical disaster relief services provided by the American Red Cross Gold Country Region as well as critical Red Cross training programs which help prepare our community members to respond in times of emergency. Get your tickets today to help us cheer them: http://bit.ly/RedCrossHeroesLuncheon. Deadline to purchase tickets is January 15. As always we’re extra thankful for our event sponsors: AMR, The Daily Democrat, The Kohlmeier Family, Nugget Markets, Pacific Gas & Electric Company, Walmart and Wells Fargo.